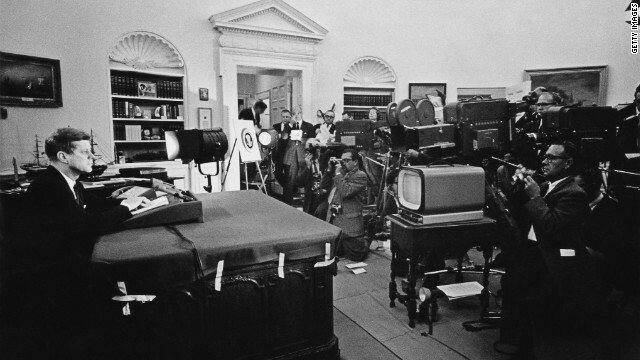 On August 30, 1963, then-President John F. Kennedy became the first occupant of the Oval Office to have an option for direct communication with the Soviet premiere in Moscow. A White House statement on August 30 said the machine would “help reduce the risk of war occurring by accident or miscalculation.” The hotline was, in affect, a Cold War stabilizer. The need for such a device was evident in the minds of those who saw how thin as a razor blade the United States and the USSR were to war. Henry Kissinger, the former U.S. secretary of state, once summed up these fears. "The greatest danger of war," he said, "seems to me not to be in the deliberate actions of wicked men, but in the inability of harassed men to manage events that have run away with them." Kissinger had reason to be concerned. During the Cuban Missile Crisis, Anatoly Dobrynin, the Soviet ambassador to Washington, relied on a bicycle messenger to pick up urgent, confidential messages intended for Moscow and send them using Western Union, a common wire service of the time. After the drama of the missile crises died down, Kennedy suggested installing a way for the United States and the USSR to connect directly. Initially, the “hotline” was a teletype, a typewriter that allowed messages to be typed from point to point. In the later 1970s, once satellite technology became standard, the teletype system was scrapped in favor of the newer technology. Contrary to popular belief, the hotline was never a red telephone and it was never located in the White House. The hotline was located in the Pentagon at the National Military Command Center. There, military personnel are able to verify messages with the White House and translate Russian transmissions. All messages from the Pentagon to the Kremlin are sent in English and visa versa from Russia to the United States. The translation is always done on the receiving end to preserve the nuance of each language. During the Cold War the hotline was used regularly. President Lyndon B. Johnson used it to inform the Soviets that the United States had not helped the Israelis surprise-attack on Egypt. Later on, President Richard Nixon used the hotline during the India-Pakistan conflict in 1971 and President Ronald Reagan reportedly threatened the USSR via the hotline when the Kremlin detained U.S. journalist Nicholas Daniloff on charges of espionage. With the Cold War now part of history, the hotline is no longer used for such pressing matters. Today, however, the system is tested every hour – with the Americans sending a message every even-numbered hour and the Russians responding every odd-numbered hour. - CNN’s Bruce Kennedy contributed to this report. "TELL MR. PUTIN THAT AFTER THE ELECTION, I'LL BE ABLE TO BE MUCH MORE FLEXIBLE"
... code words for ... if I had know there was a live mic nearby ... I wouldn't have revealed my intention to throw America under the bus ... but I'm willing to say, or do ANYTHING to hold onto power !!! Kenndy's failure with Castro was an invitation to the Russians. If those walls could talk we'd all know that failure in leadership was the highlight of the Kennedy administration. But since they can't. the LSM hero worship of JFK, like Obama, is all we see. Hey walls – what do you have to say about Clinton??? This sounds like filler for CNN.